Which Residential Fence makes sense for my Manassas Home? When it comes to choosing the right residential fence for your Manassas home, you have options…a lot of options. There are Custom Wood Fences, Ornamental Steel Fences, Ornamental Aluminum Fences, Chain Link Fences, and PVC Vinyl Fences. And each fence has its own unique set of benefits. Wood Fence: Wood fencing provides a natural and rustic look to complement your home. Unfortunately, this fencing also requires annual maintenance, which can be a deal breaker for some. But, if properly maintained, it is hard to beat the aesthetic appeal of a beautiful wood fence. Steel Fence: Steel fences are not only incredibly durable, they make a statement. Unlike your traditional residential fence, steel provides a certain wow factor other fences can’t match. Aluminum Fence: Aluminum withstands the elements better than welded steel or wood. These fences will stand the test of time. Chain Link Fence: Vinyl coated chain link is becoming very popular because it offers the security of chain-link fence together with the attractiveness of a vinyl coated finish. Vinyl Fence: Vinyl fencing has become very popular because of its clean appearance and long product life with minimal maintenance. In the end, the choice is yours. It is up to you to decide which fence makes the most sense for you, your home, and, perhaps most importantly, your budget. But no one said you couldn’t ask for help. Hercules Fence of Manassas has more than 50 years in the fencing industry. So we know a thing or two about fences and we will be more than happy to answer any questions you may have. Our sales team can offer you many selections to choose from to accommodate your needs. Hercules Fence has been providing residential fence services and installation throughout Northern Virginia since 1955. We are the largest fence company based in Virginia, allowing us to buy our products at a price that will afford you value to complement our quality. 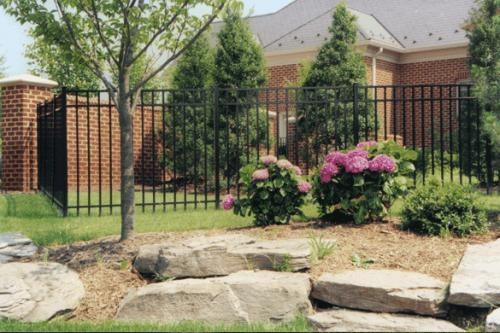 Hercules Fence can handle all of your residential fence needs. If you have any questions about a Residential Fence for your Manassas Home, please contact Hercules Fence of Northern Virginia today by calling (703) 551-2609 or visiting our website. Also, check out Hercules Fence of Manassas on Facebook, Twitter, Google+ and YouTube! This entry was posted on Tuesday, April 1st, 2014 at 2:33 pm. Both comments and pings are currently closed.